Starting about a year ago, I finally joined the breakfast smoothie band wagon. I would make them off and on before that. But I wasn’t a huge fan. I always felt hungry soon after or wanted more food. Something finally clicked with me though, and I’ve loved them. I think it helps that I can drink it as part of my cool down from exercising. And I can sip as I go about my morning mom duties – grabbing breakfast for kids, cleaning up, making beds, etc. It feels less time consuming. I’ll admit that the a berry-banana-chocolate protein powder smoothie is my go to, since I always keep the ingredients around. But it is nice to liven things up sometimes. 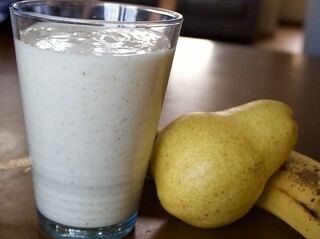 This pear cinnamon smoothie is really easy to throw together and is yummy and satisfying. Enjoy! 1. Blend ingredients until smooth.